All gîtes are fully renovated, furnished and equipped to make your stay as comfortable and stress free as possible. Fresh towels and bed linen with 100% cotton sheets are provided every week. 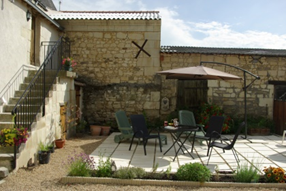 In cooler seasons, there is central heating with electric radiators available in all the gîtes for your comfort. We have a library of books and DVD films available for your use. There is also a selection of games and local guidebooks available for you to borrow from us in the reception area. For those times, when you want to contact the outside world, you have free access to WiFi broadband on site. In the courtyard, there is a utility room with a washing machine and tumble drier and also an iron and ironing board for our guests to use. In the grounds, there are sun loungers, parasols, garden tables and chairs for the use of all our guests. There are lots of sunny and shady areas in the gardens and orchard where you can relax in and a large BBQ available for all of our guests to use. 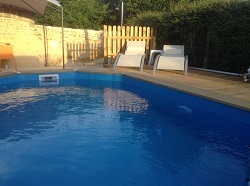 We also have a small pool where you can cool off as the temperature rises. For guests with classic cars, we offer limited workshop facilities for you to carry out any running repairs or adjustments to your vehicle.